Over the past few years, the variety of client devices in use at Intel has grown significantly. 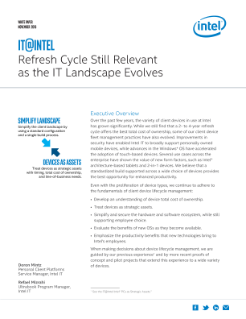 While we still find that a 2- to 4-year refresh cycle offers the best total cost of ownership, some of our client device fleet management practices have also evolved. Improvements in security have enabled Intel IT to broadly support personally owned mobile devices, while advances in the Windows* OS have... accelerated the adoption of touch-based devices. Several use cases across the enterprise have shown the value of new form factors, such as Intel® architecture-based tablets and 2-in-1 devices. We believe that a standardized build supported across a wide choice of devices, provides the best opportunity for enhanced productivity. When making decisions about device lifecycle management, we are guided by our previous experience and by more recent proof of concepts and pilot projects that extend this experience to a wide variety of devices.